There are 119 posts filed in Software (this is page 2 of 30). Remember when Google Chrome came out a few months ago? I have to admit, I was in love when I first saw it. I used it for days, and then, after a short affair, I went back to FireFox. I still hold out hope for Chrome, but it has a long way to go before it can rival FireFox, in my opinion. Then, last September, Google Chrome came into my life. I admit I was totally infatuated. She was sweet. Good looking, easy, and uncomplicated, just the way I like them. And she had something extra, something indefinable. Call it the Google magic. Whatever it was, I was hooked. We went everywhere together. Sometimes I’d have 20 or 30 tabs open at once. She was a free spirit, and nimble as hell. I loved the cute little button that let me quickly open new tabs and the way she showed me thumbnails of my favorite sites; I didn’t even have to ask. And if I needed a little private time, no problem – she’d open an incognito window for me and quietly step away. I thought it would be a three-day fling. I never imagined we’d move in together. But when you showed up, it got ugly. She hated it when another browser came into the room. And not just you; Safari, Flock, Opera, even IE during those desperate moments when a Web site just insisted on it. My system would freeze tight and I’d have to crawl under my desk and yank the power cord. It was humiliating. So I made a difficult decision. I made Chrome my default. I committed. Mint is probably the most impressive web application on the planet right now. And with the economy getting more shaky every day, who doesn’t need to monitor their finances? I started using Mint about a year ago. At that time it was nice, but pretty basic. 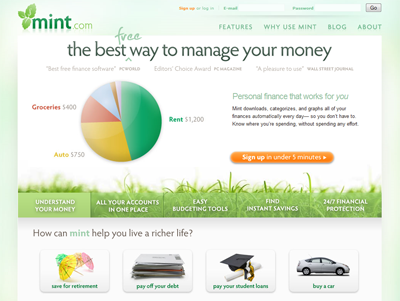 Now, Mint has one of the best user experiences on the web. From a developer’s standpoint, I’m amazed at the things this app can do and just how smooth it is. The design is great as well. If you haven’t tried it yet, I highly recommend you give it a shot.